Hello, Id like to ask a question about your experience with the 16″ Lightbridge. I’ve read some good reviews and bad reviews about it. I’ve read that it is very hard to collimate and that the focuser may not come perfectly perpendicular to the tube assembly from the factory and may need shimming to properly align it. I’d like to know your opinion on these things and also the quality of the focuser. Is there much flex in the trusses? Have you been able to attain crisp clear focus? Would you recommend this scope, or to rather spend an extra $1000 to get a similar sized Discovery scope? Collimation is an important issue when observing through Meade Lightbridge 16″. Mainly for planets and Moon, because a good collimation gives much better images at high magnification. When moving the telescope, it is usual to get discollimation, so every time you move it, you firstly have to collimate it before observing. Another disadvantage of this telescope is its weight. It weights a lot and it is not easy to move from one place to another. Nevertheless starfield views are incredible due to its high aperture, mainly under dark skies. It becomes very easy to observe deep sky objects. It is impressive to observe Dumbell nebula at 200x. To attain crisp clear focus is very difficult when observing planets or the Moon due to atmospheric turbulence. 16 inches of aperture are very sensitive to turbulence. I would recommend the telescope if you are planing to be observing always at the same place. It is a very cheap telescope taking into account its aperture. I cannot talk about Discovery telescope, because I have never watched through one of them. Polaris has a close neighbor at 18 arcseconds that can be spotted easily through a telescope. This is a 15 seconds exposure through a Meade Lightbridge 16-inch, a Dobson with no tracking, but fortunately Polaris moves very slowly through its small circumpolar path, due to its proximity to north pole in the sky. The camera used was a Canon EOS 450d, also known as Rebel XTi. The method employed was an eyepiece projection using a 14mm Meade Series 5000. 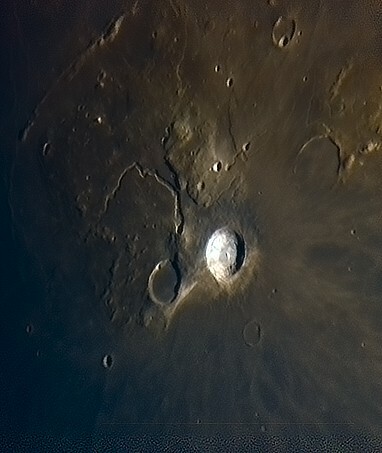 Posidonius is a big crater of the Moon on Mare Serenitatis. There is a lot of interesting details to observe inside: peaks, ridges, craterlets, … In the following image taken yesterday night, 4 km wide craters can be spot as small white points in the smooth surface of Mare Serenitatis. Posidonius measures 95 km in diameter. 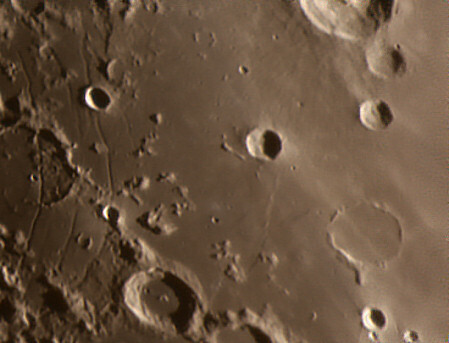 The second biggest crater (a bit ghostly) in the picture is Chacornac, just below Posidonius. Inside it is visible a small craterlet called Chacornac A (it measures 5 km in diameter). The third biggest crater of the picture is Daniell (31 km wide) located in the upper middle side. Its shape is not circular, but oval. This is the cause of a strange effect in perspective when comparing it with the craters nearby.